Summertime is for exploration, discoveries, and making memories that last a lifetime. That’s why at CF&F we believe that sport summer camps should be fun and exciting. Our fencing summer camp for beginners combines the mastery of our professional coaches with experiences that spark the imagination and introduce children to the joy of physical activity. We strongly believe that sports should both provide enjoyment and instill core values like courage and self-discipline. We will certainly challenge your children with intensive workouts, but we guarantee that they will have fun along the way and learn to appreciate the hard work. Our summer beginner fencing camp is a small window into what we do at CF&F year-round, and we welcome new students with open arms and a passion to introduce them to our world. So what can you expect for your child at our summer camp? The new fencer will learn proper fencing form and technique; basic fencing skills including footwork, blade work, and distance control; fencing with electrical equipment (always exciting for fencers! ); as well as fencing etiquette, rules, and sportsmanship (fencing is a noble sport after all). After graduating from camp with a certificate in hand, campers are eligible to attend our intermediate fencing class. But most important – they will have a lot of fun, learn a lot, fence a lot, make friends and have a lifelong memories of fantastic summer activity! 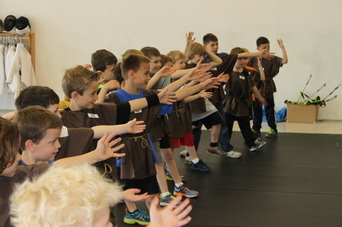 CF&F is offering several Summer Fencing Camps for 2019 at our state of the art facility located in Dublin, Ohio. To receive refund, all cancellation or transfer requests must be made with at least 15 business days notice prior to start date of the camp. For cancellation requests received before 15 days, an $80 cancellation fee will be deducted from the refund. We are proud members of US Fencing Association. Every camper must register for US Fencing non-competitive membership (cost $10) and bring proof of registration at the first day of camp. To register, go to the USA Fencing website (http://www.usafencing.org/) and click on “Become A Member”. Space is limited so early registration is advisable. Columbus Fencing & Fitness, LLC.